At a very relaxed pace, the whole team assembled near the tea shop at 8AM. Few among us moved their backpack on Mules to the higher camps. It was obvious that I would carry the backpack myself but this turned out to be a bad decision later during the trek. As a part of green trail, Me & Shubhojit carried gunny bags to pick up plastics thrown on the trails. By 8:30AM we started our first day trek to the next camp. One strange thing during the trek was there was one dog who would join us in every batch. 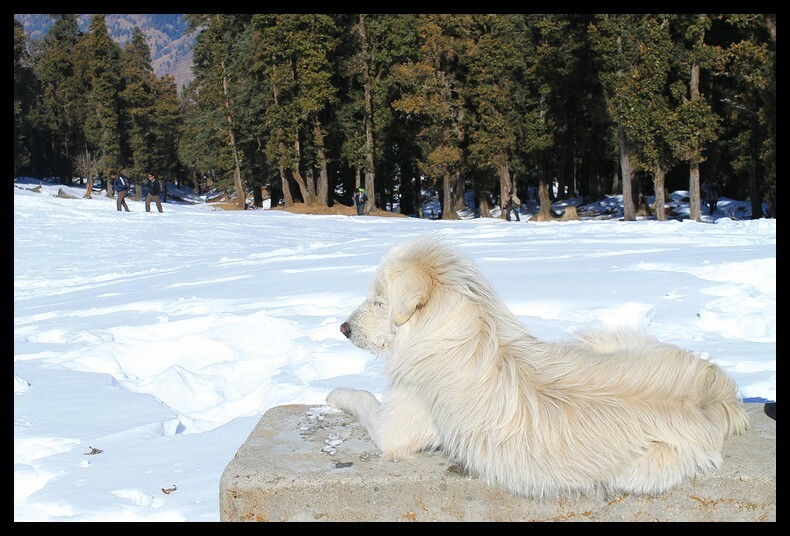 It seemed as if the dog community in Sankri had decided to send one of their representatives with us for every batch. 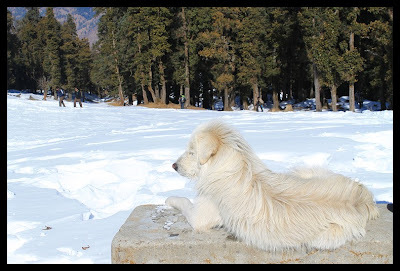 Snowy was incharge of our team :P He was really a sweet dog. I had never seen a dog so polite and quiet. He always led the team with a winner’s spirit. Today’s trek was mostly a climb so turned out a little difficult more because of my heavy back pack. I managed to stay ahead with small steps but every step charged heavy to my shoulders. I blamed myself for carrying some many clothes but meanwhile felt that the temperatures would demand them. I was wrong. It was a costly learning. By this time we knew each others pace and aligned accordingly. The sweeper group wasn’t so slow in reaching our rest point. We peeled out oranges and bananas while resting on the first few patches of snow. 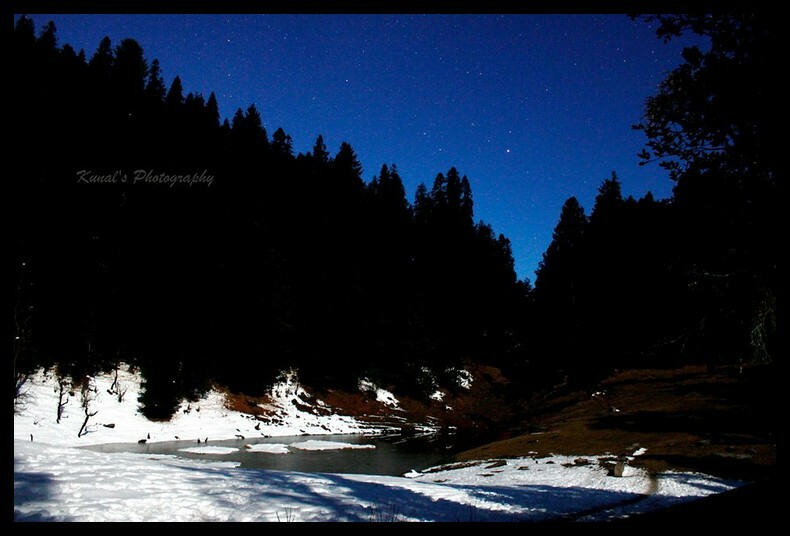 We took another pit stop 15 mins before reaching the camp, near a frozen lake. Bharti became an easy target for all the snowballs. One huge ball of snow which missed Bharti came and landed right on my left part of head and I was like “Where am I? & Who am I? ?” for a second. 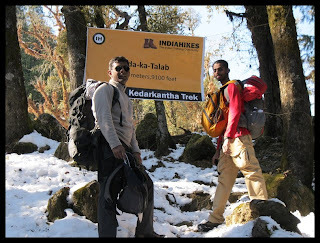 By early noon we had reached Juda-ka-taalab. 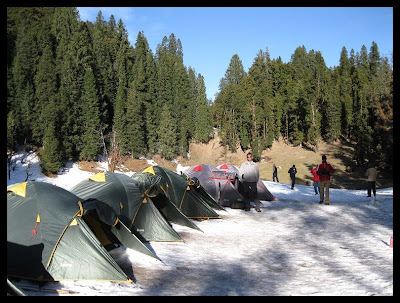 Ten tents pitched on patches of ice. 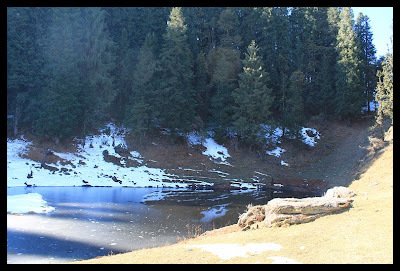 And the lake (hence the name JUDA KA TAALAB) was adjacent to the camp right next. A picture perfect place for all the cameramen. We were hungry and as promised by the organizers, we had paneer subzi for lunch. Delicious food never lets you stop eating. May be the cold also demands more. Post lunch, our cameras were out clicking the beautiful pictures of the camp site and surroundings. 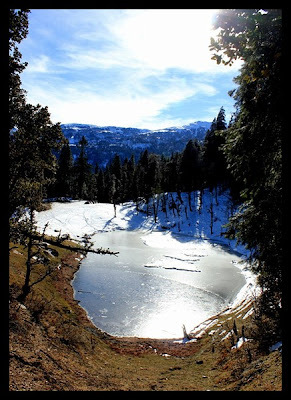 One side of the lake’s bank was covered with snow completely while the other was still dry. We sat on the grass embracing the sun shine. With time the sun moved down and the very next moment you would feel cold forcing you to move up the mountain where it was still sunny. This game continued till we reached almost top of the mountain and finally when we saw the sun on the tip of those tall trees we surrendered to settle down trembling in cold. Provided we humans could climb with ease, I’m sure all 30 of us would have been clinging onto 30 tall trees till the sun was gone. This is when I actually got to explore our trek lead. Bharti had a story which I so much wanted to hear. At one moment I felt she is speaking of my future. Brave women with lots of dreams and passion, yet a long way to go. I admired her for the – “think different & dream” attitude. At the end of this conversation I was in a totally feel good state of mind. When we were back near the campfire, the rest of them were already around the fire enjoying a hot cup of tea. We then thought of quick activities. JP suggested that we play “Dog game” which made the group go LOL for a long time. Memory game with our names and then prefixing it with adjective came in next. The major activities after the day’s trek was to sit around the fire and warm up. With night fall we were comfortably seated close enough to feel the warmth of the fire. Every hour we checked the dipping mercury levels in the thermometer. This was when almost 50% of us were cursing ourselves for taking up this trek during this mad winter. Most of us made strong promises not to repeat such blunders in future. Few imagined how otherwise they would been sleeping like a baby in their cozy beds back home. Such was the night’s cold. It dipped till -4 degrees that night and the cold breeze added so much to worsen the condition. The tents were not better than outside, few had plans to sit around the fire till dawn than to go sleep in the cold tents. This night I hardly must have slept for an hour or two. I could not move my body as the sleeping bags dint let us. I would feel suffocated if I cover my face while if I don’t my nose would freeze in cold. My toes were frozen the whole night not letting me catch sleep. This was worse than what I expected. I wasn’t felling any good that night till my alarm started at 5:30AM. I realized that I was sleeping only now. I cursed for not keeping it in silent, I dint want to move my hands out of the sleeping bag. And finally it was another day. Nice post about your trek. Well written. Nice one! :-) is there more to come? Hi CN, thank you. Yes three more in the series. Shimoo same here... Tomo's episode is when we guys actually met. Well when it comes to writing I am seeing a lot of extremes. I sometimes doubt that am I after all improving. Many a times the credit goes to the places I write about which makes my life easy, for they are so naturally wonderful to write and express. Thank you for comments :) You have always been a great critic for my writing!! !